<!DOCTYPE html PUBLIC "-//W3C//DTD XHTML 1.0 Transitional//EN" "http://www.w3.org/TR/xhtml1/DTD/xhtml1-transitional.dtd"> Story-Sun Yat-sen Univ. On Mar. 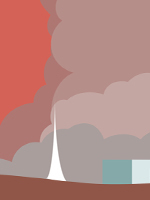 11, 2011, there happened a 9.0-magnitude earthquake near Japan. Aside from the great damage from earthquake and tsunami, the ensuing nuclear leakage raised more risks to the people and their country. Although human beings have have been through the horrible nightmare of Chernobyl Disaster, we are still incapable to solve this kind of problem effectively and safely. With constant improvement of synthetic biology, it lends possibility to utilize engineered organisms to implement the dangerous mission, clearance of nuclear leakage. Then, the question is, how to design a coherent system to achieve the goal? To approach our objective, there are two basic questions to be answered. First, is there any feasible way to control an organism to search the nuclear leakage in the radioactive environment? 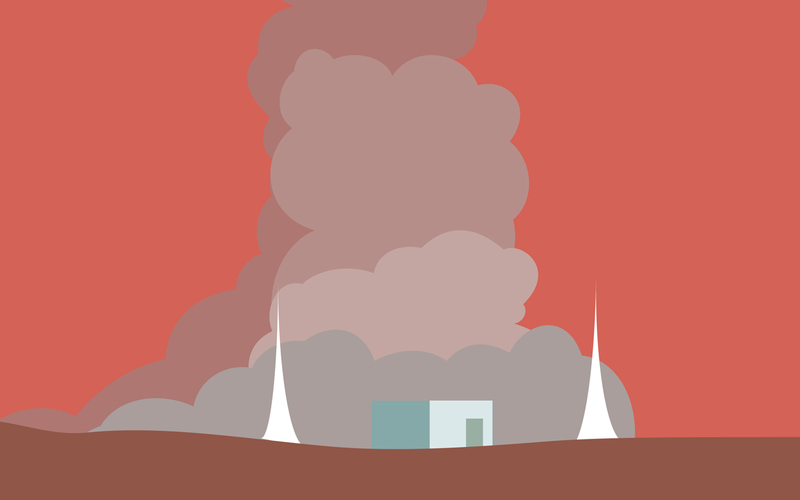 Second, is there any way to absorb the main substances of nuclear leakage? In the next several weeks after we have determined our goal, we have found several important researches. First, there are two promoters, recAp and recNp in E.Coli which could be started when E.Coli is exposed to irradiation. With these promoters, the expression of key protein CheZ in chemotaxis of E.Coli could be controlled so that the movement of E.Coli can be instructed towards radiantion probably. Second, among several main radioactive elements in nuclear leakage, iodine-131 and radon-222 have short half-life (8.3 days) but long harmful influence on human bodies, while cesium-137 has long half-life (about 30 years) in environment. Although we found the protein which could absorb iodine first, it is so enormous and complex for E.Coli to assemble. However, the transmembrane protein TrkD in E.Coli has a certain absorption to cesium, which gives us hope to dispose one of the great harmful elements in the leakage. At last, we realize the GFP and constitutive RFP could help measuring the intensity of radiation.And Antigen43 has the function to gather all engineered E.Coli. With above paramount parts, the design of nuclear-leakage rescuer has come out. Gene recA and recN in most bacteria have reflection to the irradiation and recNp has a higher threshold compared with recAp. Both promoters are responsible to repair of DNA damage, which is one of consequences when bacteria are exposed to the radiation. The small pieces of DNA could be combined by protein RecA or RecN, and then both proteins have the activity of co-enzymes, which help repression proteion LexA to self-degradation. Consequently, recAp and recNp are free from LexA, resulting in more expression of protein RecA and RecN, which is called the SOS System. Relatively, recAp responses to 2 Gy's (intensity of radiation) irradiation and recNp responses to 10 Gy's irradiation . Because of the different thresholds of promoters, we could guide E.Coli to find the nuclear substances first and then implement the absorption. In this case, the system would be more stable and effective. Protein CheZ is a cytosolic phosphatase which functions in the chemotaxis signal transduction complex, another of which is CheY. The direction of rotation of the flagellar motor is controlled by the protein CheY. 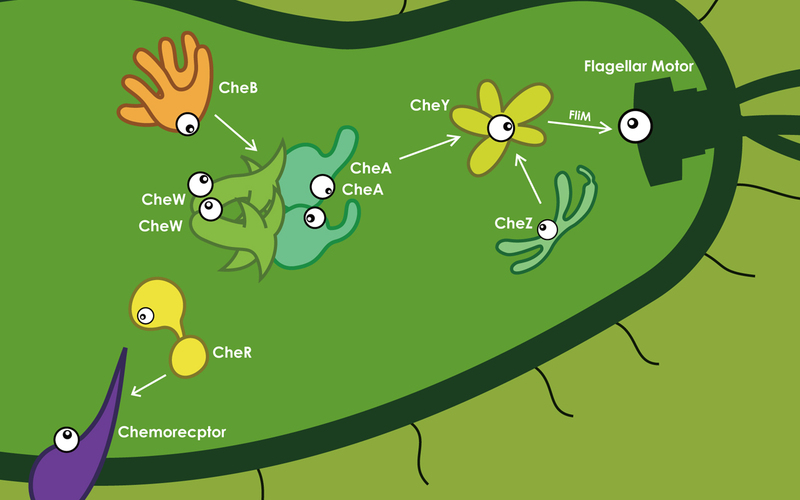 When CheY is not phosphorylated, the flagellar motor rotates counterclockwise (CCW), resulting in moving ahead of E.Coli. 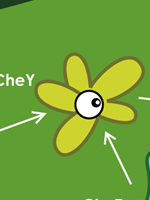 (Figure 2) When CheY is phosphorylated (CheY-P), it can bind to the flagellar motor protein FliM, causing the cell to tumble . 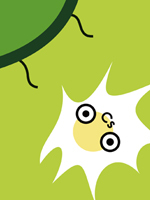 If we can control the expression of CheZ effectively, it is possible to control the movement of E.Coli. 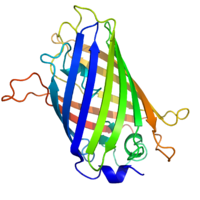 Protein TrkD (belongs to Kup system) is responsible for the low-affinity transport of potassium into the cell, with the probable high affinity to transport cesium. In contrast to Trk or Kdp, the Kup system does not strongly distinguish between the alkali cations K+, Rb+, or even Cs+. When both of Cs+ and K+ exist, the uptake of Cs+ has inhibition of that of K+ . And among several proteins in Kup system, TrkD has the best effect of uptake of Cs+. Accordingly, when E.Coli approached Cs+, the expression of TrkD would be modulated to a high level to absorb Cs-137. Protein Antigen43 is a unique autotransporter that promotes bacteria to form a cell-to-cell aggregation. Antigen 43 can be expressed on the E.Coli cell surface in large quantities, up to 50,000 copies per cell . After a period of absorption, the high expression of Antigen43 would lead to the aggregation of the colony. Considering the manipulation of function, we use low-copy plasmids to express relatively few CheZ, in case of the long time of degradation impedes the control of the movement. On the other side, we use high expression plasmid to produce TrkD, so that the efficiency of absorption could be guaranteed. To reduce the background of result, we use strains with cheZ knocked out, so that the consequence would not be disturbed by self-product. Although trkD should be knocked out from the genome of the strain too, it doesn't affect the effect of absorption of cesium ion. We construct a part consist of recAp , cheZ, egfp, rfp. Under irradiation, recAp can be started to promote the expression of CheZ. 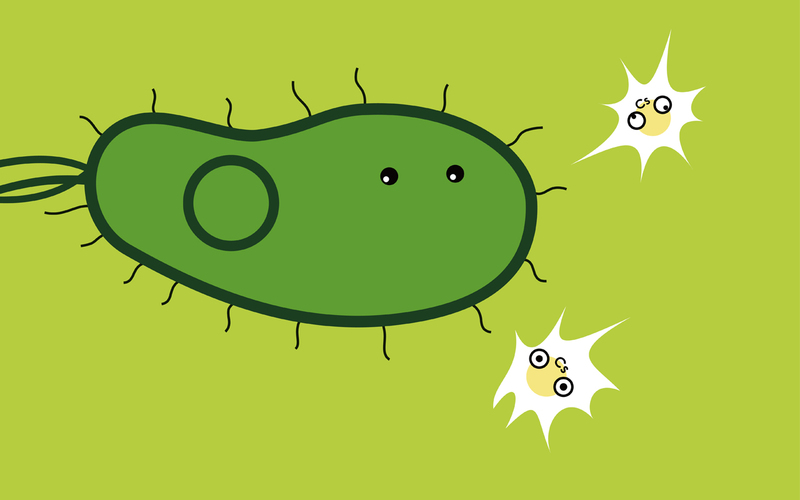 With CheZ, the direction of rotation of the flagellar motor would be counterclockwise and E.coli would move forward. However, without irradiation or E.coli moves into a normal environment, the quantity of CheZ would decrease dramatically, leading the direction of rotation of the flagellar motor to be clockwise, then the cell would tumble in one location. Meanwhile, expression of EGFP and RFP has positive correlation to expression of CheZ. In some conditions, we can see that the cells are green under normal light, which helps us to recognize whether the promoters are started more easily. When the EGFP is expressed, RFP is constitutive expressed at the same. Different cells usually have different backgrounds under fluorescence microscope. With EGFP we could know whether there exists radiation, but we cannot measure the intensity of radiation. However, with constitutive expression of RFP, the relative value of EGFP to RFP must have correlation to the intensity of radiation. In other word, RFP helps to delete the difference in background, which can be used to measure the intensity of radiation. We construct a part consist of recNp, trkD and egfp. When E.coli approaches radioactive elements, the intensity of radiation is much more than distant areas. After the intensity is higher than that of RecNp' threshold, the high expression of TrkD would be started. As a result, E.coli would absorb cesium-137 around it. 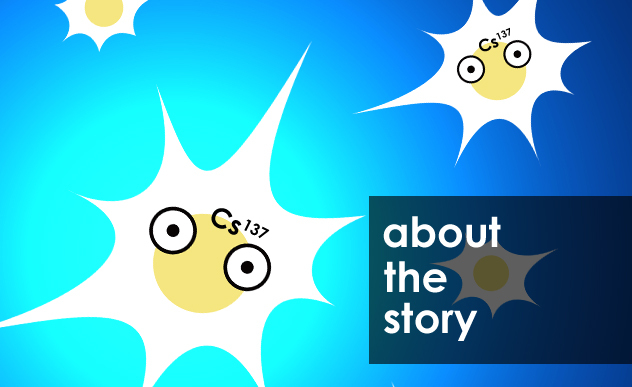 Despite successful absorption of cesium-137 in the environment, the radioactive elements are still there. So we need to find a way to clear the leakage more easily. At this time, Antigen 43 helps to aggregate the cells together tightly and the relatively big mass is easier for people to collect. Especially in the sea area, the mass would subside to the bottom more quickly and the risk distant from the mass would be much less serious. We plan to construct this part on the same plasmid with trkD, but there is a time-delay device to postpone the expression of Antigen43, so that E.coli has enough time to complete the task of absorption. 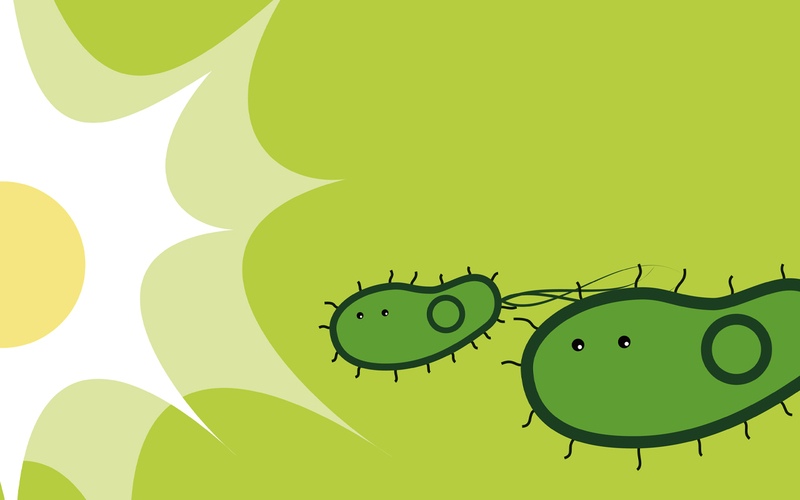 With the parts above, an E.coli could sense the irradiation and move to radioactive areas. When E.coli approaches the irradiation elements, the intensity of radiation would be higher. Then TrkD would be expressed highly to absorb cesium-137 because of the start of recNp. After absorption for a period of time, Antigen43 would be expressed highly and all E.coli would gather into a ball in the water finally. After about 3-months' efforts, we have constructed the chemotactic part and absorption part successfully. However, we still have a lot of work to do to integrate our project. For instance, we need to construct the aggregating part and measuring part later and adjust its parameters. Moreover, the specificity and sensitivity of temporal parts need to be improved, so that better manipulation would be achieved. Furthermore, with consideration about safety of engineered E.coli inputted into our environment, we will design a proper recovery method to protect these functional plasmids from gene flow. S. Nuyts et al., Radiation Research. 155, 716 (2001). S. Topp, Justin P. Gallivan, J. AM. CHEM. SOC. 129, 6807 (2003). 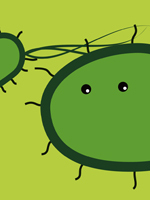 D. Bossemeyer et al., Journal of Bacteriology. 171, 2219 (1989). P. Marguet et al., JR Soc Interface. 4, 607 (2007).